Uglyworld #165 - Wedgehead Arrives With Some Cookies, originally uploaded by www.bazpics.com. Cousin Wedgehead arrived today all the way from Orange County in California, USA. He had originally packed a huge case full of cookies which he ended up losing on the way through customs - Wedgie said that they made up some story about cookies being on the list of endangered biscuits and that they had no choice but to stop them being exported. As he didn't want to disappoint the other uglies by arriving with no goodies he changed his flight to go through London on his way to Dusseldorf airport, and picked up some biscuits at a local Asda in the UK - he opted for a packet of Garibaldi biscuits which he said looked like they would be "super tasty" as the writing on the packet says that they're crammed with chewy currants! 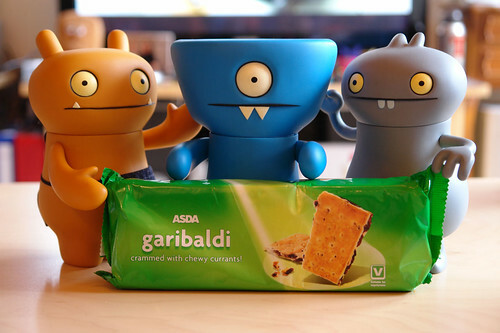 Wage and Babo were over the moon to see that he had arrived and they're looking forward to tucking into the Garibaldi biscuits tonight with everyone else.